Highlander chose to spend his 50th birthday in Italy (Rome, Florence and Venice) a few years ago as a most memorable milestone trip. We went all over The Eternal City (churches, piazzas, the Colosseum, Trevi Fountain, Roman Forum, the Vatican, cafes and more) and were awed by the history, art, architecture and culture! On Capitoline Hill, we saw the famous statue of the she-wolf suckling twins Romulus and Remus, the mythological symbol of the founding of Rome. According to the popular legend, the unwanted twin sons of the war god Mars and a Vestal “virgin” were cast off into the River Tiber. A she-wolf found the babies and nursed them as her own, until a shepherd came and raised them. When the brothers grew up, they fought over a site where they were to establish a city. 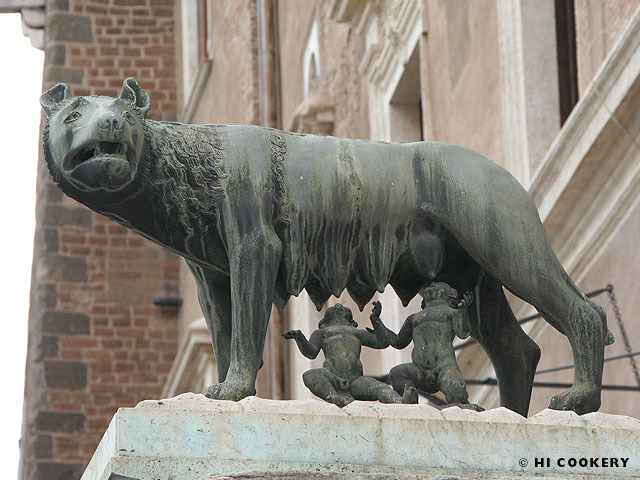 Romulus killed Remus and became king of the Italian capital that bears his name. 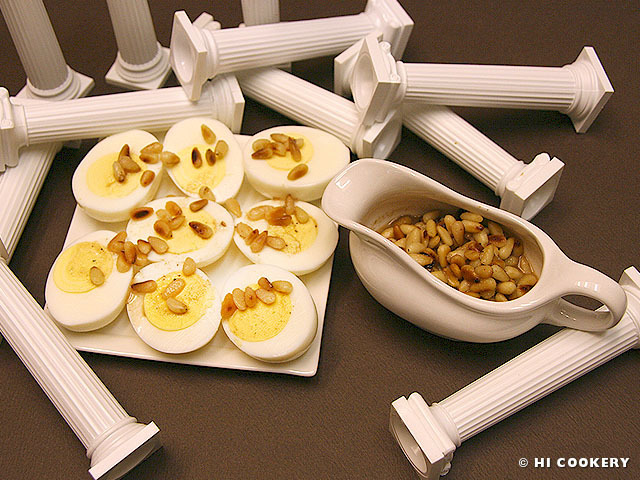 In observance of the birthdate of Rome, we ate an ancient appetizer called In Ovis Apalis (boiled eggs with a pine nut sauce). There is an old Latin saying “ab ovo usque ad malum” which translates to “from the egg to the fruit,” suggesting the courses of an Italian meal from the beginning to the end (or from antipasti, primi, secondi and all the way to dolci). Do as the ancient Romans did and eat In Ovis Apalis to celebrate Rome’s birthday! Boil the eggs. Cool down. Remove the shells. Cut them in half lengthwise. Set aside to make the sauce. 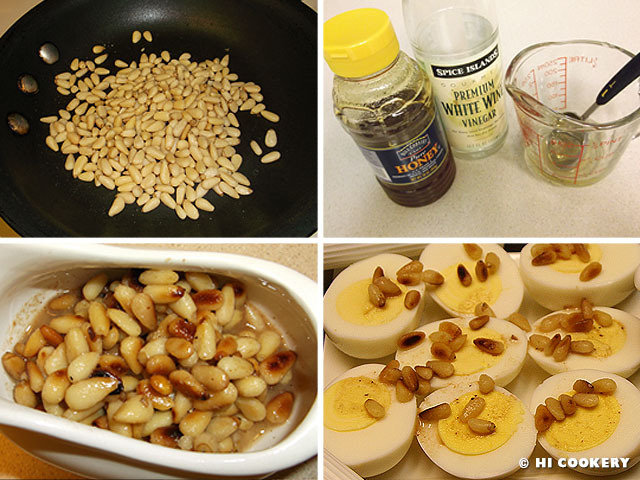 Toast the pine nuts by sautéing them in a pan till lightly browned (about 5 minutes or less). Remove to cool. In a measuring cup or little bowl, combine the vinegar, honey and pepper. Stir in the pine nuts. 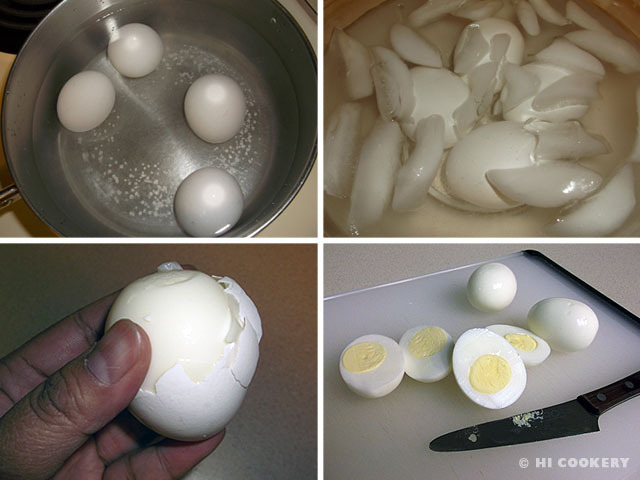 Place the sauce in a small dish or serving boat to accompany the boiled eggs. Pour the sauce on the eggs and eat immediately to avoid making the yolks soggy. In Ovis Apalis is also a good recipe to use up leftover boiled Easter eggs. Ancient Romans added a pinch of lovage (celery leaf) to the sauce recipe. We toasted the pine nuts to accentuate its flavor. Soaking them in the sauce somewhat tones down the acid in the vinegar. Highlander’s birthday is on April 20. Our trip to Italy for his 50th year coincided with Roman (and national) celebrations around the week of April 21. Several museums and public events were free or discounted then, allowing us to take advantage of what the country’s tourism industry had to offer. Search our blog for other Italian recipes.